Tucked into the top row of the C shelves of the Mill Library is an unassuming collection of tracts—written in response to the Corn Bill (ultimately passed in 1815) and the early nineteenth-century agricultural depression that led to the Luddite disturbances— and bound together under the title Corn and Labour. Those with the fortitude to forage past An Enquiry into the Causes of the High Price of Corn and Labour; Wages Must Rise; Thoughts on the Causes of the Present Difficulties and Internal Distresses of the Country, and its sequel, Hints, Addressed to the Serious Consideration of the Tradesman, the Agriculturalist, and the Stockholder; and Thoughts on the Causes and Consequences of the Present Depressed State of Agricultural Produce; will find a rich harvest of marks, annotations, and editorial corrections from James Mill sown throughout the margins of his friend, David Ricardo’s, Essay on the Influence of the Low Price of Corn on the Profits of Stock. 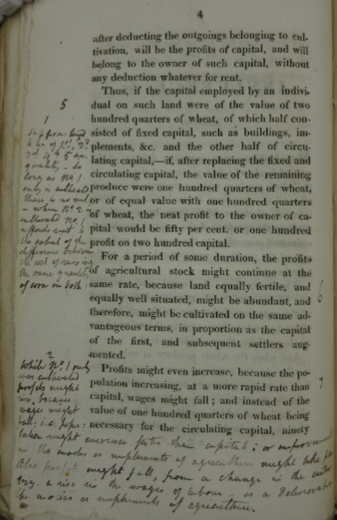 Note also the annotation, which concludes by yoking “profits of stock” to “the cost of producing food.” Food for the thought of capitalists in a period of agricultural protectionism. 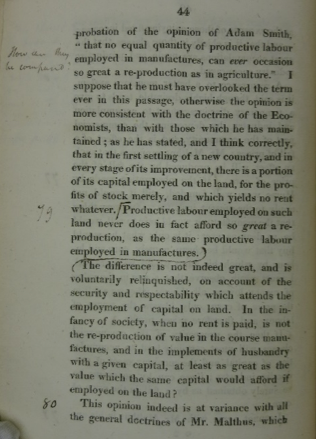 Here, Mill asks Ricardo to clarify his rejection of Thomas Malthus’s approval of Adam Smith’s statement about the relative value of improvements made in agriculture and manufacturing, writing simply “How can they be compared?” On this same page he also suggests a new paragraph break at “Productive” and a subsequent paragraph wrap through “employed on the land?”; with these specific editorial changes proffered in order to emphasize the disagreement with Malthus in the first place, and to better define the terms of that break in the second. Neither Ricardo’s subsequent pamphlet, Proposals for an Economical and Secure Currency, nor the remaining two tracts in the volume, receives much attention from Mill, who has apparently cast his immediate stock of editorial seed upon corn prices and stock profits. 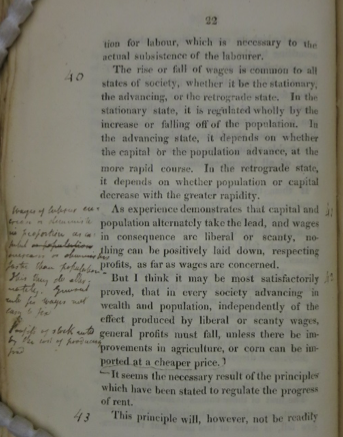 The results achieved by Ricardo only two years later in Principles of Political Economy and Taxation suggest that Mill’s editorial labor was not performed entirely in vain, even if, up until now, it has remained hidden in the margins of this earlier and more occasional text.